How Secure Is Maduro After Venezuela’s Sham Election? 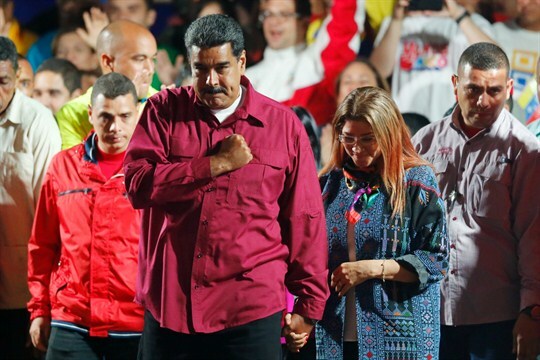 Venezuelan President Nicolas Maduro before addressing supporters after his re-election, Caracas, Venezuela, May 20, 2018 (AP photo by Ariana Cubillos). There was never any doubt about who would win Sunday’s presidential election in Venezuela. The lead-up was so patently undemocratic that even before the vote took place, the results were rejected as illegitimate by a large number of countries, including the United States, Canada, the entire European Union and a dozen of Venezuela’s neighbors in Latin America. That, however, was hardly the end of the challenge for the international community and, more crucially, for Latin American countries growing more worried about the impact of Venezuela’s social and economic collapse on them.